Grown, processed and spun in the beautiful South Island of New Zealand, this yarn represents the creme-de-la-creme of organic yarns and sustainable farming methods. I got terribly excited when I discovered this yarn. It is remarkable! Treliske is run by Robert and Jackie Aitchison, the third generation of their family to have custody of this pristine 3,000 acre station near Roxburgh, Central Otago. The Aitchison’s association with organic farming dates back over 20 years, through a vision to farm in harmony with nature and society. This yarn is sold in a few retail outlets in New Zealand, and I understand it is becoming increasingly popular in the US. Treliske’s philosophy is to make this yarn as affordable as possible to the public, so they sell the yarn at wholesale equivalent prices from their website. When found in a retail outlet, it is generally more highly priced. Service from the website is fast and efficient. 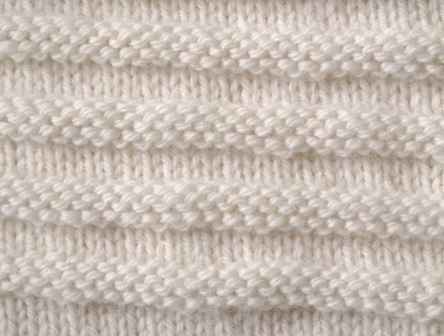 There are two yarn types – organic merino and Bio-Natur. Both are certified organic. The organic merino is self-explanatory. Bio-Natur is cross-bred lambs wool. What can I say!? These yarns are just Yummy! Everyone whom I have given this yarn to hold has declared it the softest merino they’ve ever felt. Even those who visibly curl up in horror at the very word “wool”. It is very, very wearable against the skin and oh so perfect for the baby. That wonderful sweet, sheepy scent is still very faintly detectable. All the colours available are the natural fleece colours of the sheep. Isn’t it great the variety that you can get in nature!? I am in love with the cottonwool-soft silver, cream and marl shades, and plotting lovely cuddly jumpers for me and my family. The dark brown and tweed colours are less squishy, but still very wearable. If you have ultra-sensitive skin, I’d say these two colours in particular are more suitable worn with a cotton undergarment. Personally, I found the recommended needle size for the 8 ply too small to create a good tension. I got a very nice supple fabric of the recommended tension using 4.5mm needles. The 4 ply knits up to a good tension on 3.25mm needles. 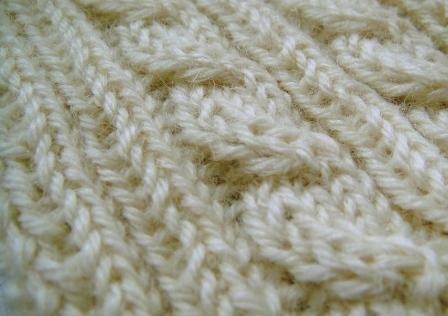 The yarn knits up very smoothly – no snagging or splits. It washes well, and doesn’t need a huge amount of blocking. Just a dream yarn, really! I haven’t experimented washing knits with this yarn in the machine, but shall report back when I get around to it. 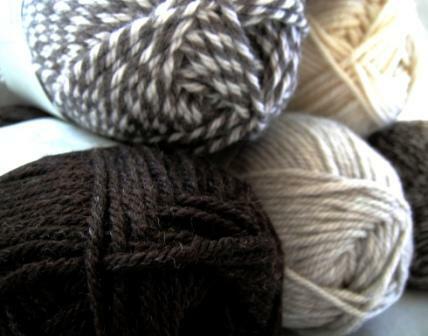 This yarn is available in three natural fleece colours – cream, donkey and dark brown. It’s cheaper than the merino, although both yarns are very reasonably priced. I felt that the recommended tension for this yarn was a bit loose. I used a 4mm needle, and got a 21s x 29r sample, which felt about right.